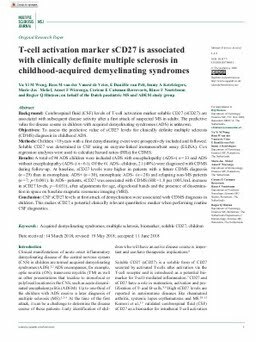 Background: Cerebrospinal fluid (CSF) levels of T-cell activation marker soluble CD27 (sCD27) are associated with subsequent disease activity after a first attack of suspected MS in adults. The predictive value for disease course in children with acquired demyelinating syndromes (ADS) is unknown. Objectives: To assess the predictive value of sCD27 levels for clinically definite multiple sclerosis (CDMS) diagnosis in childhood ADS. Methods: Children <18 years with a first demyelinating event were prospectively included and followed. Soluble CD27 was determined in CSF using an enzyme-linked immunosorbent assay (ELISA). Cox regression analyses were used to calculate hazard ratios (HRs) for CDMS. Results: A total of 94 ADS children were included (ADS with encephalopathy (ADS+) n = 33 and ADS without encephalopathy (ADS–) n = 61). Of the 61 ADS– children, 21 (48%) were diagnosed with CDMS during follow-up. At baseline, sCD27 levels were higher in patients with a future CDMS diagnosis (n = 29) than in monophasic ADS+ (n = 30), monophasic ADS– (n = 28) and relapsing non-MS patients (n = 7; p < 0.001). In ADS– patients, sCD27 was associated with CDMS (HR = 1.8 per 100 U/mL increase in sCD27 levels, p = 0.031), after adjustments for age, oligoclonal bands and the presence of dissemination in space on baseline magnetic resonance imaging (MRI). Conclusion: CSF sCD27 levels at first attack of demyelination were associated with CDMS diagnosis in children. This makes sCD27 a potential clinically relevant quantitative marker when performing routine CSF diagnostics.